which kept popping in the wind. here is the man with the plan...the other birthday person...butter bill. but first we all met up at mojo cafe. and then my balloons kept hitting people in the face. sorry!! but we got an action shot! 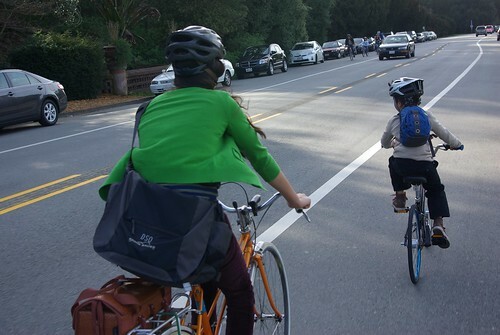 it was too windy for a ride out to the beach, so we opted for riding pretty much all over golden gate park. 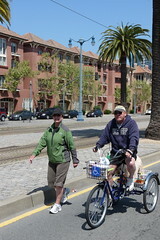 we had a music bike, and some mamakSF! oops, we had to turn around at the casting pools. 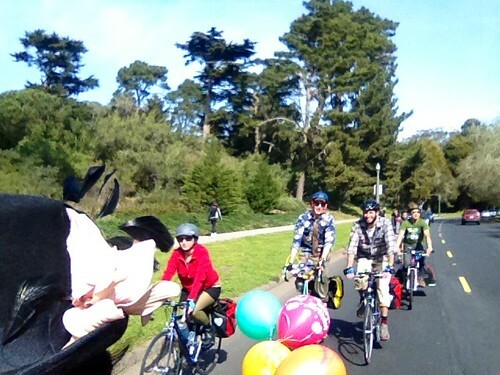 why only ride in ggp? well, because we had performers we couldn't miss. don't cry over smushed cupcakes! they were delivered by bike! manymanymany thanks to all who came on the ride, who brought food, friends and fun. i literally have never seen that nice weather on my birthday that i can recall. it's in FEBRUARY for goodnessssssake. but maybe this year is a statistical anomaly (weather-wise) or global warming is starting in earnest. whatever the cause for the nice weather...i'm so glad i was able to celebrate it outside!!! <3<3 now if next year is blustering and cold, things will be back to normal. There is a lot of orange in the bicycle world. The Bat is rolling kinda hipster incognito these days. Lots of tiny happy birthday bicycles for the fashionable. Úna will not give up her orange mixte. Even now that it is getting a bit small for her. Why? Because it is orange, of course!! today is mah birfdae y'all. i normally don't really celebrate it cause geez that's a lot of candles, but a friend of mine asked me to do a joint birthday party with him. couldn't turn that down. what are we going to do? why, go on a bike ride of course! weather is still freakishly warm here in february. tomorrow is supposed to cool down, but will be in mid-50s. still gorgeous riding weather. i do believe pictures will be taken. and then shared. happy friday to you all, especially the pisces among you. thanks for reading and have a great ride this weekend! Exploring the Route to Freedom, put on by the Adventure Cycling Association. "To further our goal of encouraging people from all walks of life and cultural backgrounds to explore the landscapes and history of American by bicycle, Adventure Cycling began a partnership with the Center for Minority Health at the University of Pittsburgh in 2004. 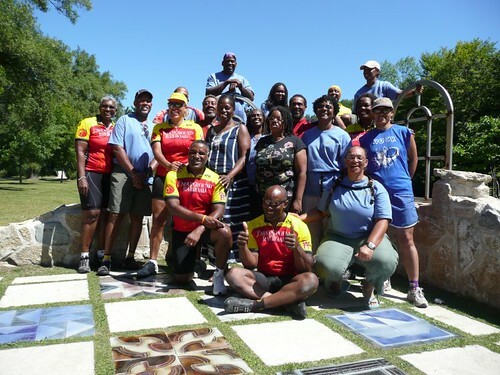 With America facing a national health crisis, Adventure Cycling and the Center for Minority Health saw a natural alliance born from common goals." february is black history month. while i might scoff at one month per year to celebrate any one group of history, had it not been, i might not have found out about that terrific bike project of ACA. there are several routes to choose from that follow the historic underground railroad route where slaves worked there way north to freedom before the end of the civil war and the awesomeness that is juneteenth. there are two main routes. the first one travels from mobile, alabama up to ontario, canada. there's also a brand new, and how i discovered this 5 year old project, detroit alternate route which takes you from oberlin, ohio to owen sound on lake huron's georgia bay. this looks like it was an amazing undertaking with a lot of people on the advisory board in order to get this route just right. many thanks to the many hands that had a say in this project. looks like an amazing route, full of history. history and bikes?! my two favoritessssst interests combined. pretty spectacular. all other pictures are by dennis coello. a big huge hat tip to the fine people over at outdoor afro, one of my favorite blogs ever. why? because it features african-americans in outdoor settings. if there's a US latino equivalent to outdoor afro and someone knows about it, please please please post the URL in the comments. "You could sit at home and watch a YouTube video and try to figure this out. It's doable. But why not come out and learn, once and for all, how to change a flat tire with a little human interaction. At this hands-on workshop, we'll start with the basics, then give you the tricks and secrets of fast and easy flat fixing. At the AM session, we'll get jacked on Fayes coffee and Pepple's vegan donuts. At the PM session we'll savor fresh Firebrand pretzels and ice cold beer (Anchor Steam and IBC). We'll even send you home with a set of our favorite tire levers. 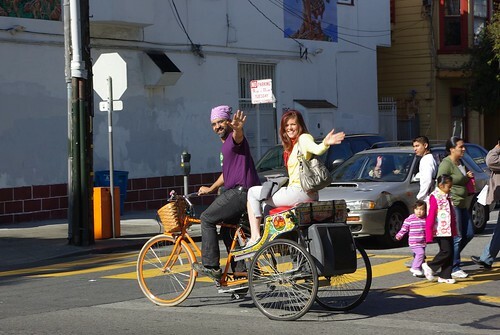 We end the session with a group ride - a tour of the Mission District's 11 bike related businesses. One last thing. No spectators allowed. Nobody admitted without a bike. Come prepared to get your hands dirty"
The 2-18 class is full but there is one on March 10th. Even though Todd taught us how to patch a tire parked next to dog poop in the past, and I used to patch my own tires sometime in the last century, I look forward to a hands on lesson on a room full of people who are less likely to laugh at me than my husband. 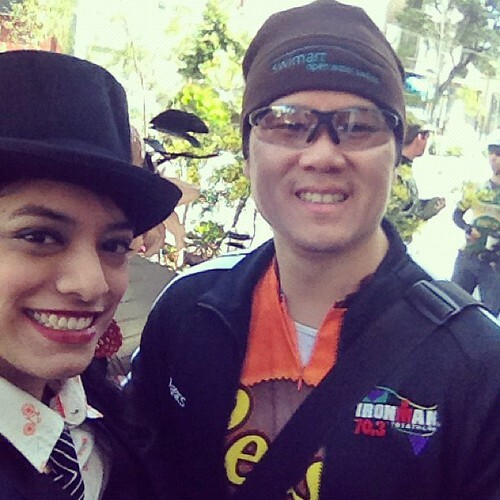 We have written before about Don Rafa and his store over on 16th near Mission street in SF. I went in a couple of times, but since is not close to my house, nor do I work near there, I was an infrequent visitor. I definitely appreciated his presence in the latino community as a bike store that caters to what some people call the "invisible cyclists." That term makes me think of fingernails on a chalkboard, and I'm glad that the store will live on through his daughter. Rafa Macias, who was known to many as Don Rafa, has passed away. The owner of Don Rafa’s Cyclery at 2929 16th St. suffered a heart attack while driving home from his daughter’s house on Jan. 20, according to another daughter, Lupe Macias. He was 60 years old. He had worked on bicycles for most of his life, first in Mexico and then in the Bay Area. 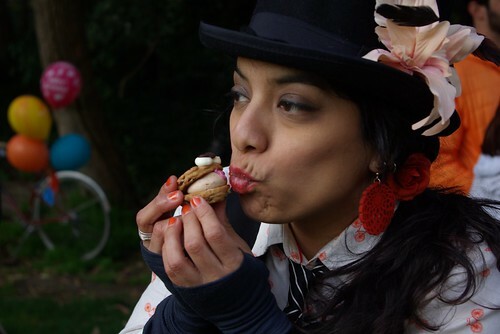 In the late 1990s, Macias moved to the United States and started working at local swap meets, renting space and fixing bicycles on site. Here's to a new generation over at 16th St. Cyclery! We extend our condolences and wish the family well. asked a little girl. i was sitting down the other day eating at a local spot next to my apartment. i was reading a book and eating by myself. i like eating by myself, but i guess that was slightly too much for her 3 year old head to wrap around. we had a pretty adorable conversation after that. Don’t forget! 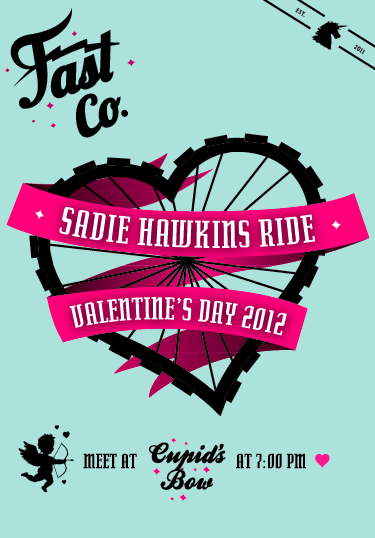 Valentine’s day is coming up and what better way to celebrate than by riding your bike with Fast Co! We have a really sweet ride planned for you all, with some surprises along the way. The route is short but there are two moderate hills (sorry everyone! It is San Francisco, after all), so be prepared. Riders of all skill levels on all bikes are welcome! It is a fun, group ride, so no one will be left behind. If you have never done a group ride before, let this be your first! The very talented duo Terry Barentsen and Tatum Mangus will be taking photographs, and we will be ending at the Palace of Fine Arts. QUE ROMANTICO! If you have any questions, please don’t hesitate to contact us. See you there!!! While we have a really wonderful cargo bicycle...OK, while we have two really wonderful cargo bicycles in our family we sometimes strip it down a bit on shopping day. Where there is a need for silly amounts of breakfast cereal there is a way to get it home on your fixie. No excuses, go shop on your bicycle! love: it all starts here. i don't know who this "burinboonvisut" person is, but i rather enjoy their pictures over on instagram. they posted picture the other day, and it made me feel warm fuzzies everywhere. please go and hug someone you love today. i know i will be. muchmuch love to all of you, and thanks for reading. people. 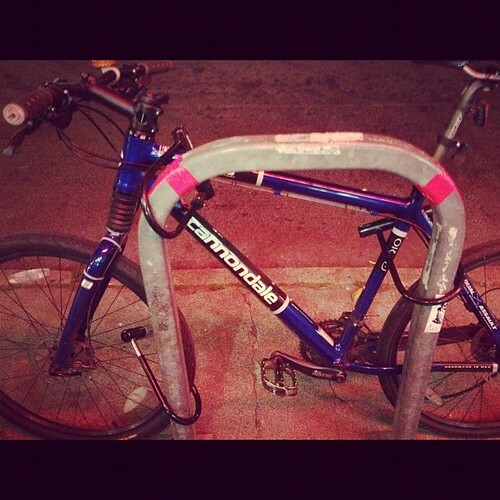 how many times do we have to say lock up your bike with a ulock?! a few friends of mine had bikes jacked recently. and yes, they used a cable lock. this video shows a guy cutting through a cable lock fairly quickly. not long ago i was struck hard by the economy and using my bike was a good way to get around for cheap. 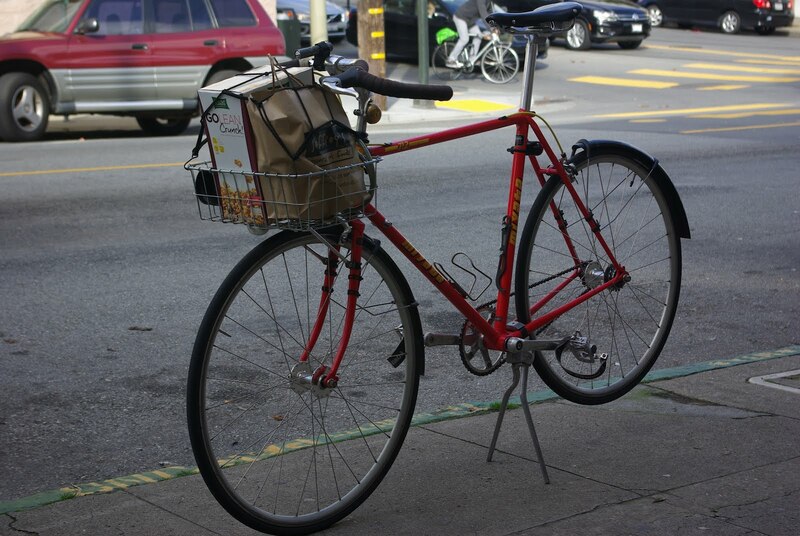 i didn't really have $30 to spend on food, much less a bike lock. i justified it this way: buying a ulock is cheaper than getting a new bike. do you think you are too poor to buy a lock? then check your local craigslist for ulocks. i took that route and ended up paying $20 for a lock i still use. that was 4 years ago. guy was moving out of town, never rode his bike thus didn't need his lock anymore either. i'm sure similar situations are still happening here in SF or wherever you live too. obviously knowing how to lock up your bike is crucial too, no matter how many ulocks you carry with you. ulocks are not fail proof, but they certainly are great deterrents. by the way, SF police are still looking for this guy. anyone with information is asked to contact Inspector Pomatto at (415) 558-5400 or by email at steven.pomatto@sfgov.org. We got it goin' on, too! let's start off this wednesday with a game: what is wrong with this picture? i apologize that not all of the clues are in the picture, but you can probably take a wild guess what is missing. three is the magic number. but only sometimes. i came across this video in my RSS feed. my favorite is when he's doing the crossword while riding. 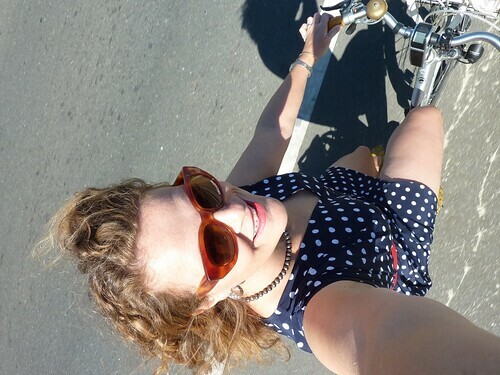 the director, Guillaume Blanchet, writes, "I love being on a bike. It helps me feel free. I get it from my dad." I took the picture on Saturday, but the day of the week is inconsequential where my friend Deep and his fiancée are concerned. 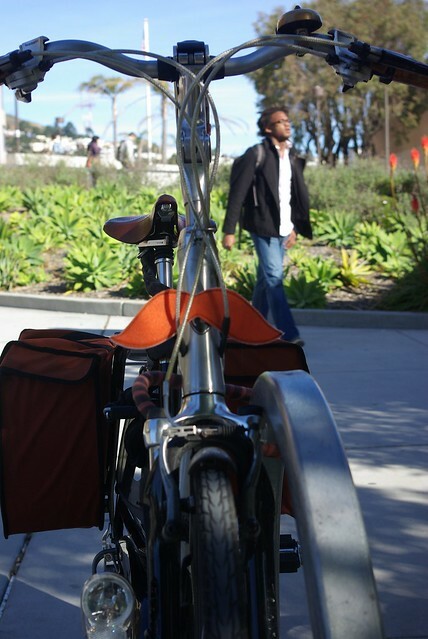 I am almost more impressed by how many people do not give them a second look than I am by the fabulousness of Deep's one off Public bike/Indian rickshaw hybrid. 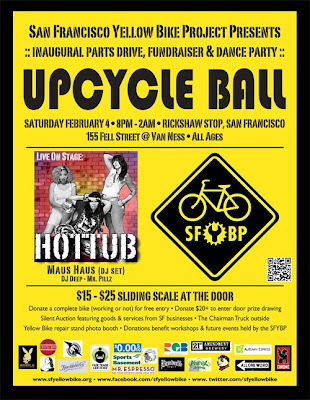 bay area readers: bike nonprofit fundraiser this saturday! 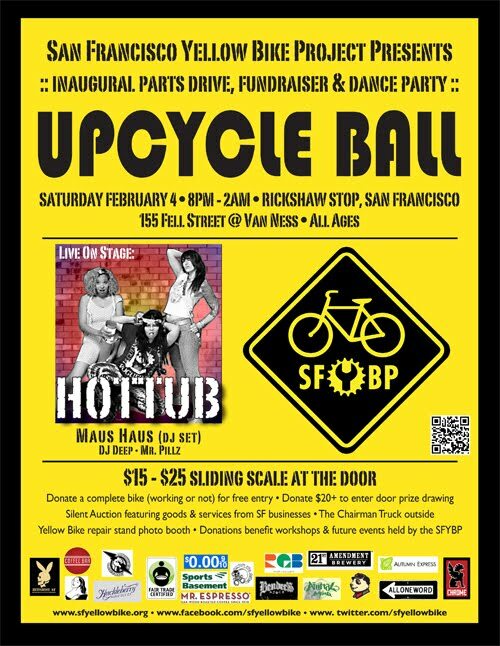 THE UPCYCLE BALL this SATURDAY 2/4 at the RICKSHAW STOP! 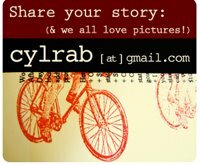 friends of the blog are starting up a community bikey non-profit y'all called SAN FRANCISCO YELLOW BIKE. it is based on the idea of austin's yellow bike project and they are bringing it to the bay. please come out to support their first fundraiser!! bring in bikey parts or tools for donations. sounds so right on to me! see y'all there. have a great weekend everyone. back to typetypetyping for me.